I have vitaligo skin disease. It causes me to sunburn really easily. I have had a hard time finding a sunscreen that works as advertised. 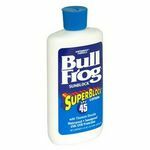 This stuff works and it is relatively cheap compared to some I have tried. I used to have to be very careful outside and try to be in the shade as much as possible. I am still careful but I don't panic when I am in the sun when I am wearing this. Great product. 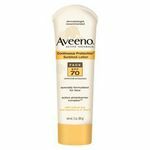 Sunscreen that's actually not greasy! Used this sunscreen on a recent vacation and fell in love. I don't feel sticky when it's on and I don't need to reapply very often. The scent is mild and not overpowering, which is also a big plus for me. I would recommend it to people who are picky about sunscreen and concerned about their health. Protect skin at a nice price with Trader Joe's SPF 30. I brought along a few 6 fluid ounce tubes of *Trader Joe's Face & Body Sunscreen SPF 30* during my recent trip to Cozumel, Mexico. I didn't go tanning before my vacation, so I started with [a spray SPF 50] for the first few days and then switched over to this product for the remainder of the trip. I was very happy with this product! 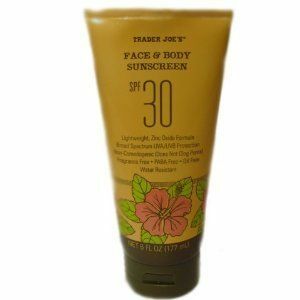 This *Trader Joe's Face and Body Sunscreen SPF 30* is inexpensive, provides broad spectrum UVA/UVB protection, is non-comedogenic, is fragrance, oil, and PABA-free, and is water resistant. It is a yellowish cream with medium consistency that spreads easily across skin, though it does not absorb quickly. Regular applications on both my body and face every two hours or so kept my skin from frying and burning in the tropical sunshine. I was very happy to see that this product didn't block the pores on my face as advertised (non-comedogenic) and I was able to just keep one tube of sunscreen in my bag each day instead of worrying about separate facial and body lotions. I have absolutely no complaints about this *Trader Joe's Sunscreen* except for the fact that it isn't clear if the product was tested on animals. 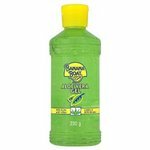 The price is comparable to typical commercial brands but is also oil-free, fragrance-free, PABA-free, and non-comedogenic. The best part is that it protected my skin day in and day out while allowing me to develop a gorgeous dark brown tan. I will definitely be stocking up on this *Trader Joe's Face and Body Sunscreen* for summer. Highly recommended! 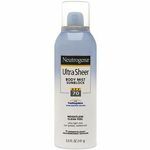 : http://www.viewpoints.com/Up-and-Up-Sport-Sunscreen-Continuous-Spray-SPF-50-review-202a7 Scent This sunscreen has your typical somewhat-chemical kind of scent. It isn't delightful but it also isn't offensive. It is what you'd expect from a sunscreen. Absorption This sunscreen absorbs fairly quickly into skin. 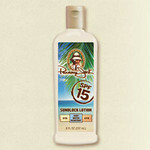 Longevity This sunscreen easily provides 3-4 hours of protection per application. Effectiveness This sunscreen does a great job of protecting your skin from overexposure to the sun's ultraviolet rays. I don't think I ever had any sunburn while using this product. Ease of Application It is simple to use this stuff: simply squirt some of the cream from the tube into your hand and then rub it into your skin. Trader Joe's makes a great sunscreen. I really like the Trader Joe's Face and Body Sunscreen. It can be used for both face and body, although I still use my face specific Burt Bee's lotion most of the time. It is a very excellent price, which makes it affordable. It is the perfect consistency to spread all over, without leaving much of a residue. It also has a pleasant odor and doesn't smelly chemically. Looking at the Skin Deep Database, I see that it has a toxicity score of 4, which is very low for a sunscreen. The health hazard is listed at 5. The ingredients that increase this toxicity are listed as octinoxate (an active ingredient), ceteareth-20, retinyl palmitate (vitamin a palmitate), and magnesium aluminum silicate. I am a fan of this sunscreen. My cheap side is very satisfied. I will keep buying this as long as they stock them at Trader-Joe's. I also like that it does not cause me acne breakouts. It also is very effective at preventing sunburns. Just reapply if you get wet. Love the former sunscreen mentioned but, unfortunately they switched to one that uses Avobenzone...great at blocking the sun but has recently been shown to be cancer causing. I've bee unsuccessful at trying to locate the manufacturer of the former.